US and allied diplomats went on the offensive against Russia at a UN Security Council meeting Sunday, provocatively accusing Moscow of “war crimes” in Syria and demonstrating their readiness to risk a direct military confrontation with the nuclear-armed power. The emergency Security Council meeting was called by permanent members the United States, Britain and France with the explicit aim of making unsubstantiated allegations of war crimes against Russia. She went on to charge that the Syrian government, which began an offensive on Thursday to take rebel-held parts of Aleppo, was indiscriminately bombing residential areas with Russian support. “Instead of pursuing peace, Russia and Assad make war. Instead of helping get lifesaving aid to civilians, Russia and Assad are bombing the humanitarian convoys, hospitals, and first responders who are trying desperately to keep people alive,” claimed Power. British Foreign Secretary Boris Johnson went even further, telling an interview on the BBC Sunday that Russia should be investigated for war crimes. The handwringing of US and British politicians over alleged human rights abuses is thoroughly hypocritical. In truth, the collapse of the weeklong ceasefire early last week was triggered by the deliberate bombing of Syrian army positions by US aircraft—positions that were well known to coalition forces. The attack enabled Islamic State fighters to assume control of the area. In addition, US-backed “rebels” dominated by the hardline al-Nusra Front, the former Syrian branch of Al Qaeda, systematically violated the terms of the ceasefire. The subsequent attack on the aid convoy could have been perpetrated by these forces, who have been accused of blocking civilians from fleeing. Russian UN Ambassador Vitaly Churkin stated that reaching a peace deal in Syria was “almost impossible” due to Washington’s continued support for al-Nusra. “They are armed with tanks, APCs, field artillery, multiple rocket launchers… dozens and dozens of units, including heavy weaponry… Of course, they couldn’t have made this equipment themselves. All of this has been received by them and is still being shipped to them by generous Western backers, with the US, presumably, turning a blind eye,” Churkin commented at the Security Council meeting. He went on to accuse al-Nusra of blocking humanitarian aid to Aleppo and launching indiscriminate attacks on government-held areas. Clashes intensified throughout the country Sunday. Between 26 and 43 civilians were reported killed in bombing raids on eastern Aleppo, which is controlled by anti-Assad forces dominated by al-Nusra. Meanwhile, rebels shelled government-controlled Masyaf for a second day running. 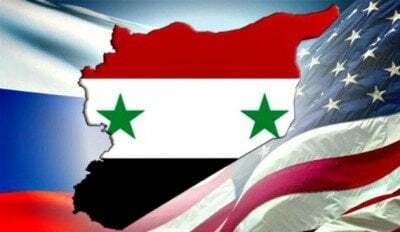 It is becoming increasingly evident that Washington and its allies never saw the ceasefire as a means of bringing an end to the five-year conflict. Instead, they agreed to the deal in order to buy time to resupply their proxy forces, which were coming under mounting pressure from Assad’s troops, backed by Iranian and Hezbollah fighters, and to prepare a massive intensification of the war for regime-change in Damascus. In a public demonstration that they would accept nothing short of full capitulation by the Assad government to their plans for regime-change, Power and the French and British UN ambassadors left the Security Council chamber as the Syrian ambassador spoke. The transparent aim of the aggressive denunciation of Russia is to provide a fraudulent pretext for war. From the claim that Libyan leader Muammar Gaddafi was preparing to massacre civilians in Benghazi in March 2011, to the lying allegations that Syrian government forces launched a poison gas attack in August 2013, and now the unsubstantiated allegations about Russian “war crimes” against the civilian population, Washington and its allies have repeatedly utilized such “human rights” propaganda to legitimize a vast escalation of military violence throughout the Middle East. The corporate-controlled media has gone into overdrive in its efforts to demonize Russia and cast the US as a morally outraged bystander. Articles and television news reports routinely cite the aid convoy attack, which they attribute to Russia and the Syrian government without any hard evidence, as the cause of the ceasefire breakdown. Reports then appeared Sunday alleging that cluster munitions, white phosphorus, chemical weapons and barrel bombs were being deployed against Aleppo neighborhoods. The US-incited war for regime-change in Syria has already claimed the lives of close to half a million people, forced more than half of the country’s population to leave their homes, and further destabilized the entire region. Despite the open acknowledgement that a no-fly zone would mean war, the incendiary policy is finding growing support, including from Secretary of State John Kerry. In August, the US backed a Turkish incursion into northern Syria to oust Kurdish rebels from the border region. Turkish President Recep Tayyip Erdogan has vowed to establish a so-called safe zone across a large area of the north of Syria. This would entail the permanent presence of troops from a NATO member state within Syria, creating yet another flashpoint with Russia. Muallem also denounced Turkey’s incursion in strident tones, declaring that the US-backed operation was a flagrant breach of Syrian sovereignty. In a lengthy interview on Russian television Saturday, Foreign Minister Sergei Lavrov warned that the Kremlin was increasingly unwilling to compromise in the face of Washington’s provocative actions. Lavrov charged that no progress had been made in separating the al-Nusra Front and other Jihadi forces from the so-called “moderate” opposition. Unless Washington took steps to do this, “our suspicions that this all is being done to take the heat off al-Nusra Front will strengthen,” he declared.